Daikin’s wall mounted units are an ideal solution when refurbishing your room. They have a modern design and look, are extremely quiet in operation, are energy efficient and they create a very comfortable living room, kitchen or bedroom climate, day or night, the whole year round. Furthermore, the high-quality air conditioning equipment of Daikin not only offers the possibility of cooling, it can also provide warmth. That way you can adjust the indoor temperature perfectly to your own personal needs, the whole year through. The indoor unit can be used in pair application, with one indoor unit connected to one outdoor unit. Daikin’s inverter technology is a true innovation in the field of climate control. The principle is simple: inverters adjust the power used to suit the actual requirement - no more, no less! This technology provides you with two concrete benefits: Comfort The inverter repays its investment many times over by improving comfort. 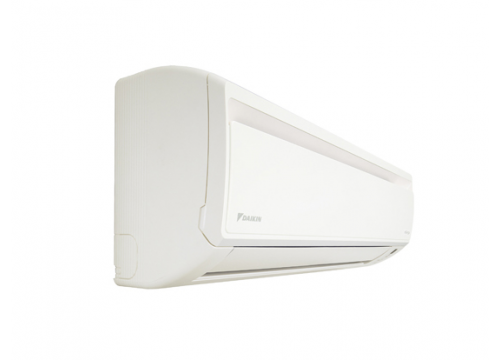 An air conditioning system with an inverter continuously adjusts its cooling and heating output to suit the temperature in the room thus improving comfort levels. The inverter reduces system start-up time enabling the required room temperature to be reached more quickly. As soon as the correct temperature is reached, the inverter ensures that it is constantly maintained. Energy efficient Because an inverter monitors and adjusts ambient temperature whenever needed, energy consumption drops by 30% compared to a traditional on/off system! (non-inverter). Air-to-air heat pumps obtain 75% of their output energy from a renewable source: the ambient air, which is both renewable and inexhaustible. Of course, heat pumps also require electricity to run the system, but increasingly this electricity can also be generated from renewable energy sources (solar energy, wind energy, hydropower, biomass). A heat pump’s efficiency is measured in SCOP (Seasonal Coefficient Of Performance) for heating and SEER ( Seasonal Energy Efficiency Ratio) for cooling. When selecting the energy saving function ECONO mode the power consumption decreases so that other appliances that need large power consumption can be used. (for classes 20,25,35). Energy saving during standby operation: current consumption is reduced by about 80% when operating on standby. (for classes 20,25,35). Night set mode: ensuring a good night sleep and saving energy, by preventing overheating or overcooling during night time. The comfort mode guarantees draught-free operation. In heating mode, the warm air is directed to the floor. In cooling mode, the cold air is directed to the ceiling (for classes 20,25,35). Vertical auto swing: this unit supports the selection of vertical auto swing, which ensures the even distribution of air and a homogeneous room temperature. Built-in intelligence: Rapidly heat up or cool down the room in 20 minutes with powerful operation. After this period, the unit returns to its original setting. Whisper quiet operation: the sound of the indoor units is so low it can be compared to rustling leaves. It’s possible to lower the sound of the wall mounted unit by an additional 3dBA, by engaging indoor silent operation on the remote control (down to 22dBA for FTX20,25JV!). A source of pure air Dust and odours are trapped by the titanium apatite photocatalytic air purification filter, to provide you cleaner air.